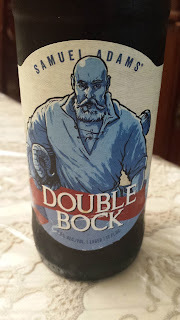 This week's Sunday Night Suds looks at Samuel Adams Double Bock. Bocks--you know, those beers with goats on the label--are relatively strong German lagers. Doppelbocks--as the name might suggest--are typically even stronger and contain enough malty goodness that they've been considered a meal in a glass for centuries. Generally they have a very full-bodied flavor and are darker than their little Bock brothers and sisters and a higher level of alcohol too. They range in color from dark amber to nearly black, and dark versions often have slight chocolate or roasted characters. The Double Bock is a dark brown beer which poured with above average lacing and decent carbonation. Its rich, almost as full bodied as a barley wine and the alcohol is present behind the malts. The beer is high on the abv scale, even for a dopplebock as it is 9.5% abv. But the alcohol flavor is not off putting and the beer would go well with rich meat dishes such as brisket or cholent. The Samuel Adams Double Bock is under the Kosher Supervision of the Star-K and has a Star-K certification mark on the bottle. To see what the experts on Beer Advocate think about this brew, please follow this link - beeradvocate.com/beer/profile/35/44785. If you are reading this post more than six months after it was written, please note that it is possible that the product is no longer still certified kosher. To verify that the product is still certified kosher, please click on the kosher beers list link on the top left corner of the blog.